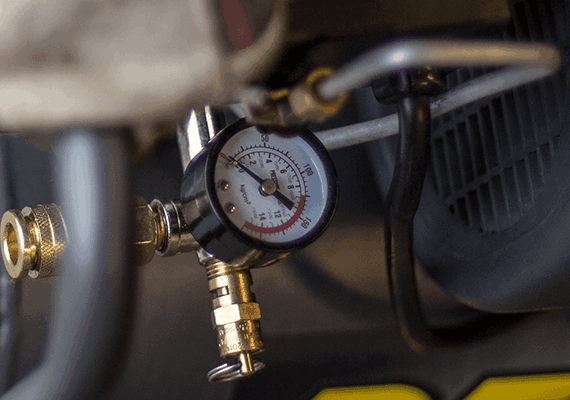 PSI is the measurement of pressure an air compressors can produce in pounds per square inch. Nearly every compressor can produce 100 PSI or more. The majority of air tools require 90 PSI to operate properly. CFM at 90 PSIis the amount of air volume that a compressorcan move measured in cubic feet perminute at 90 PSI of pressure. Do not acceptsubstitutes for the measurement; SCFM,ACFM, displacement etc, are all variants used in advertising that may sound good, but can be misleading. The bigger the tank the more reserved air is available. A large tank means less start/stop for the engine & pump (which wears them out faster). A large air reserve also allows for using higher demand air tools for limited periods of time. However, a larger tank will limit portability. Pumps create friction and heat. Oil-free pumps use coatings that reduce friction such as teflon. These pumps are lighter weight & can operate at any angle as there is no oil to spill. Oiled pumps usually run cooler and have a longer life span but that oil has to be maintained and they must be upright to prevent oil from leaking out. Single stage pumps consist of one or more cylinders that are all the same size and feed air straight into the tank. These are typically lighter weight, less expensive & are limited in the maximum PSI they can produce (typically 125 PSI). The chart below includes some common air tools and their average CFM measurements. Reference this chart to determine what continuous CFM rating is required of your air compressor. Air tools are often rated as "Average CFM". "Average CFM" is typically based on a 25% duty cycle (15 seconds out of a min.). This sometimes creates a problem with tools that are used on a continuous basis (ex. orbital sanders, die grinders, etc.). Nailers and impact wrenches typically don't have the same problem since they are used more intermittently. If you plan on using an air tool on a continuous basis, it is best to multiply the "Average CFM" x 4 to get a continuous CFM rating for the tool.